The game, which lasted 138 minutes and 38 seconds, is the longest game in the history of Division III men’s hockey surpassing the previous record of 98:42 set by Minn.-Crookston and Milwaukee School of Engineering as UM-Crookston defeated MSOE 2-1 in 2 OT on Feb. 23, 2002. It is the second longest game in all of collegiate hockey falling just 2:57 shy of the overall record, a 141:35, five-overtime 3-2 victory by Division I Yale over Union (N.Y.) on March 4, 2006. Gustavus registered 104 shots on goal compared to 57 for Augsburg and Auggie netminder Justin Lochner set an NCAA Division III record for saves in a game with 97. The previous record was 95 set by Daniel McIntosh of Northland College against Adrian on Jan. 23, 2009. Saturday’s game began at 7:05 p.m. and ended at 12:35 a.m. on Sunday morning — 5 hours and 30 minutes. The Gusties trailed 5-3 late in the second period and cut the lead to 5-4 after two periods on a goal by James Leathers at 18:43 of the second period. 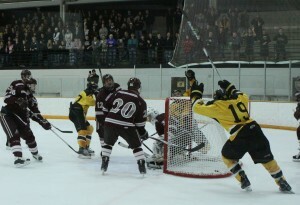 In the third period, senior forward David Martinson tied the game at 5-5 on a goal at the 16:04 mark. The game would remain tied for the next 82:34 before Eric Bigham came from behind the net and scored a wrap-around goal on his knees sliding the puck through the pads of Lochner. 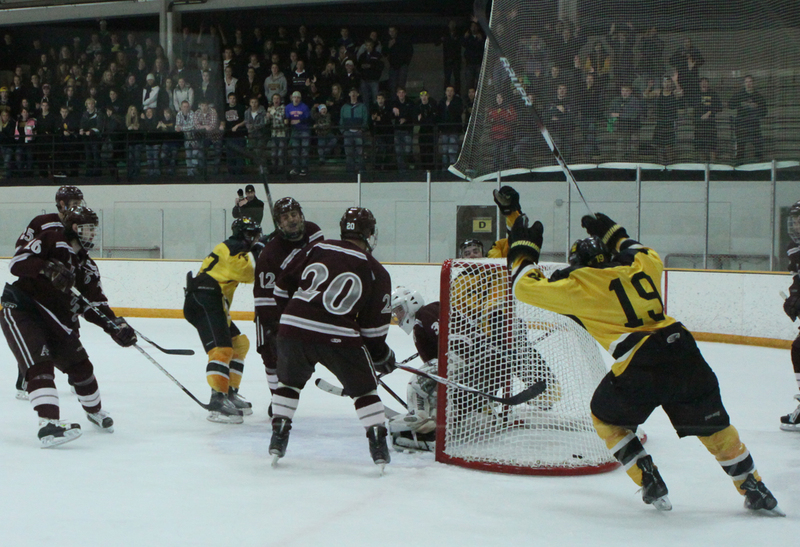 Five different players scored for Gustavus including David Martinson (2), Bigham, Rory Dynan, Mitch Carlson, and James Leathers. Six different player also were credited with assists including Patrick Dynan (2), Spencer Campion (2), T.J. Ridley, Ross Ring-Jarvi, Rory Dynan, and David Martinson. Goaltender Josh Swartout played all 138 minutes and 38 seconds of the contest allowing five goals and making 57 saves (a career high). He improved his season record to 17-3-2.